Who says there’s no such thing as a free lunch? Just got back from my favorite eco-responsible pick up lunch to go spot, Pret. I am hoping to do lunches from home soon but not there just yet – will start next week. So I went to Pret, being frugal and ready to order only a cup of soup when I noticed their Wheel of Fortune posted on the wall. I asked if they’d spin it for me. They obliged, and it landed on the equivalent of a Price Is Right car: a frrrreeeeeee lunch! Everyone clapped as I collected my sandwich, snack, drink, and soup (the soup I still purchased since it didn’t come with the lunch). 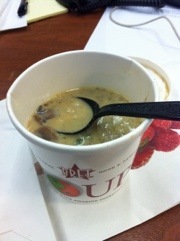 Mushroom risotto soup – might not look like much but it made me plenty happy today and supplied my Friday dose of umami. Oooh, Mami! Thank you Pret!